Can you believe I dared to put Sharpie marker on our beloved Legos? I’m just that kind of wild and crazy Mom, I’ll tell you. 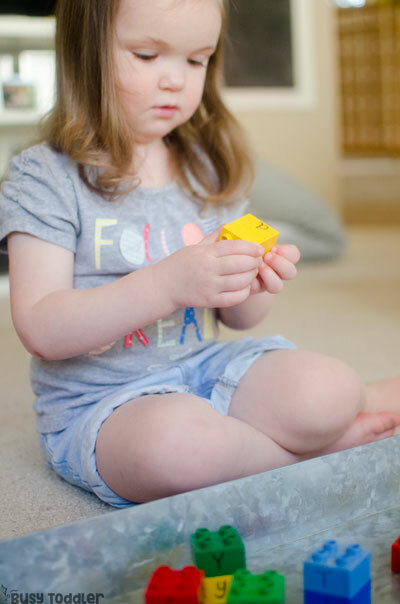 This easy letter naming activity was perfect for my daughter and exactly the right way for us to make it to nap time! 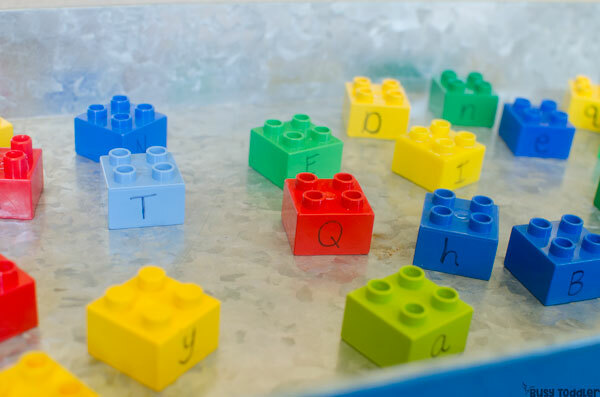 This alphabet activity was a snap to set up – it couldn’t have been easier but let me tell you, it’s a little more than just letters on some Duplos. I made a few modifications to make this activity perfect for my 29 month old. I knew that matching 26 letters would be way fatiguing and overwhelming for my daughter. So I paired down the alphabet to just the tricky letters. Tricky letters are my way of saying “letters that look really different in capital and lower case forms” like Rr and Gg. 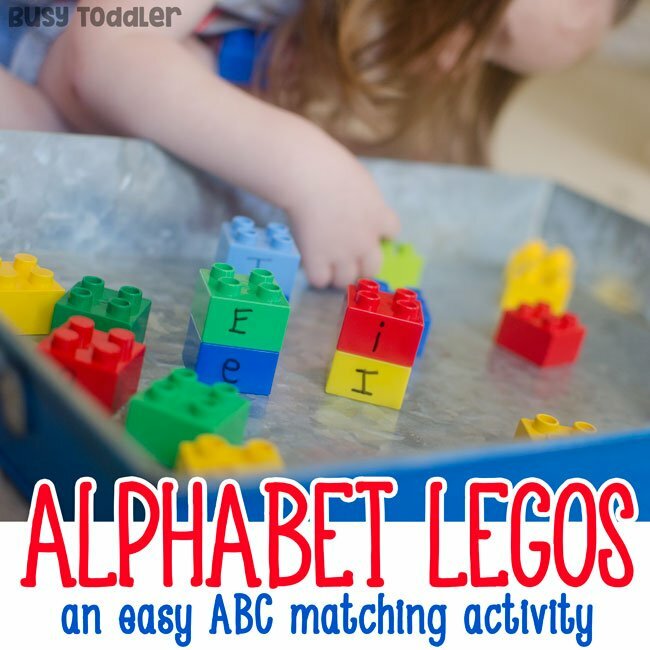 Easy letters like Ss and Cc don’t need as much practice as these tricky letters do. So for this activity, we worked on only tricky letters. 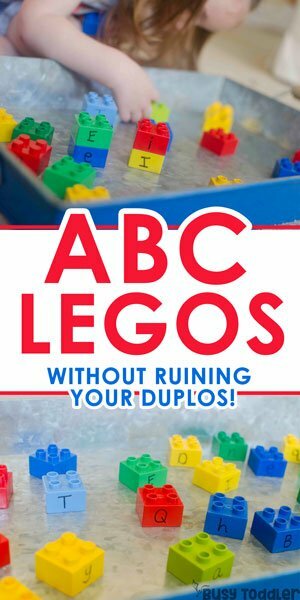 I pulled out my Duplos and wrote the upper and lower case version of each tricky letter on the Duplos. I wasn’t worried about putting Sharpie on my Legos! 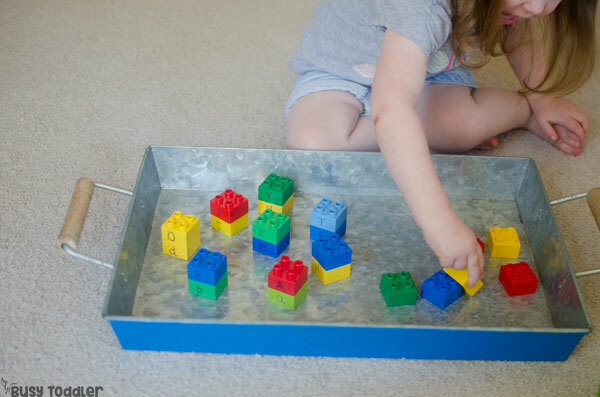 I set the Legos in a tray to keep things contained. I’m all about a well-defined learning space. My daughter was off to the races. This was a great chance for us to sit together and admire the letters and talk about any that she had questions about. She’s big into the ABCs right now so I’m happy to make activities like this for her. Time to clean off those Legos! It’s a snap to clean the Sharpie off the Legos with one little trick: hand sanitizer! A few squirts of hand sanitizer with a rough sponge and VIOLA! Clean Legos (and probably cleaner than before the activity). Definitely test this trick on your Legos before committing to doing them all, but this trick is a miracle. The hand sanitizer won’t clean Sharpie off things like couches and carpet, but it will take it off of slick surfaces like Legos and cookie sheets. This letter naming activity was awesome for my Lego loving daughter. She had the best time matching her letters then building a giant Lego letter tower at the end. Priceless! 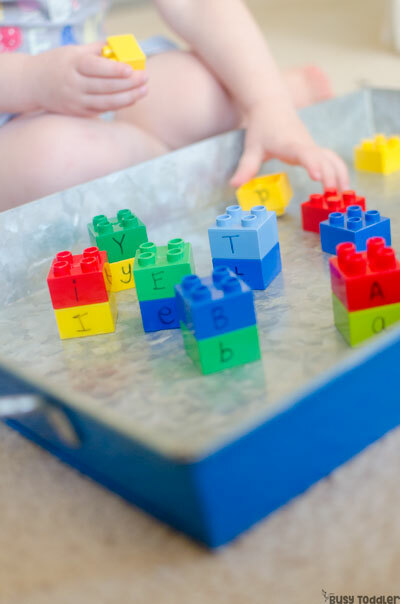 Legos are awesome for learning with, like in this Counting and Patterning activity or to use with Kinetic sand. 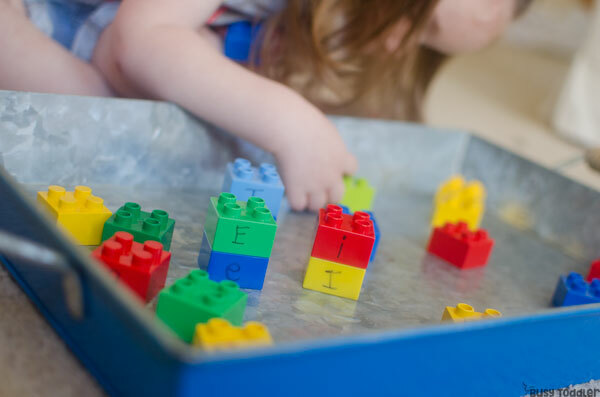 Will you try this letter naming activity with your child?